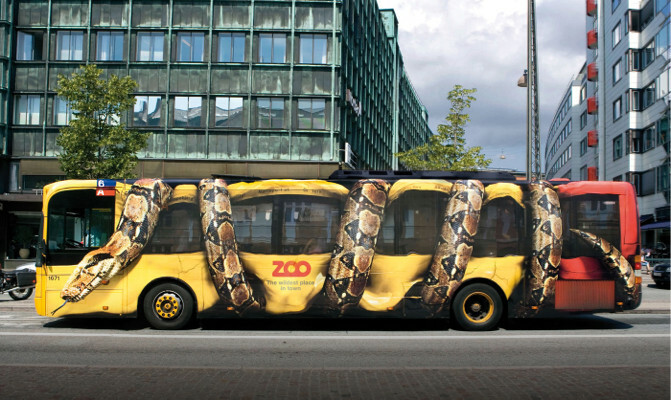 The depicted bus is not a special "snake line", but an ordinary bus on line 6A which is fancifully decorated as a full-exterior ad bought by the zoo. Line 6A does go from the city center to the zoo -- there are several stops in the city center, such as at Nørreport, Rådhuspladsen, near Vesterport in front of the "Palads" movie theater, and nearish the central station (diagonally across the intersection from Hotel Astoria to the northwest of the station). You'll want the direction with destination "Rødovrehallen". You won't be able to get a ride in a snake-decorated bus, though. The ad campaign ran in 2010, and the involved buses have long since been returned to normal livery or other ads. Not the answer you're looking for? Browse other questions tagged public-transport buses copenhagen zoos or ask your own question. Arrival at Schipol airport at 6 am from close to Kronenburg tram stop?